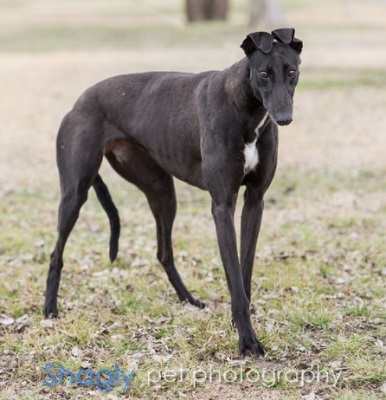 Pansy is a 3 year old black female born in 2015. She was part of the population from the blood bank facility located in Cherokee, TX that closed in November 2017. Pansy has been evaluated and has completed her medical procedures by GALT's veterinarians. She is a shy, sweet girl. Pansy is ok with cats but we don't know yet about other small animals. Please check back periodically for updates on this sweet, shy girl as her journey to a forever home unfolds. “All bark and no bite” was a statement written for dear Pansy, our resident drama queen. 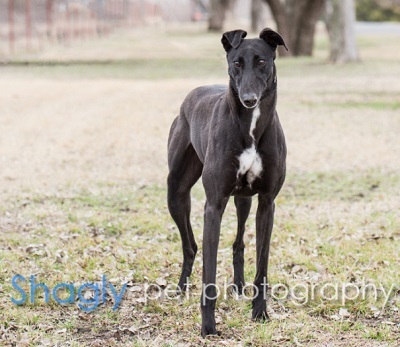 A petite, black girl, Pansy is extremely timid. She has the unfortunate experience of being dog-bullied in the running yard but still prefers canine company. Pansy really does not trust humans yet and will freeze when touched. She barks when a person comes near and if she gets loose, she will run away until the point of exhaustion. Therefore, a good foster situation for Pansy will be one with a) a very alert and patient foster human with b) a calm and tolerant greyhound (pack), c) no children and d) a solid fence!